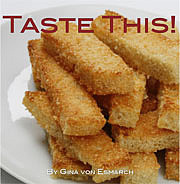 Published on January 20, 2010 in Recipes. 2 Comments Tags: 'A menèsta 'mmaritata, Anna Amalia, Càrola Francesconis, Italian Wedding Soup, La Cucina Napoletana, meatballs, Minestra Maritata, olla podrida, soup. While some of you may imagine that this is a cleaver way to discuss marriage, it is really more about a ‘marriage of food’. That said, I must confess, I had *never* heard about this soup when I lived in Italy – I only discovered this tasty dish a few years ago. Minestra Maritata is a traditional Neapolitan greens and meat soup, which owes its name to the fact that the ingredients go well together — si maritano bene, i.e. they are well married. It’s also a very old dish; some food historians say it derives from the Spanish olla podrida (a liquid stew with many meats, link in Spanish) while others say it derives from Roman traditions. 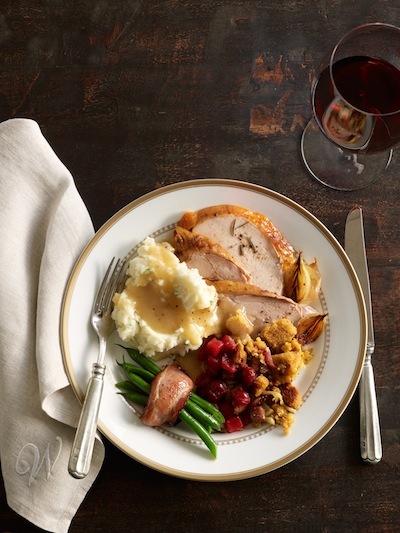 The Italian recipes for Minestra Maritata I have seen call for a variety of meats, which are boiled, shredded, and returned to the pot with the greens. The American versions of the recipe often call for meatballs. Yes, you guessed it- while I am of Italian decent, I AM American. My version of this dish keeps to some of the core concepts and consist of green vegetables (I like to alternate between endive and escarole or cabbage, lettuce, kale, and/or spinach) and meats (usually meatballs and/or sausage but shredded chicken is also a nice substitute) and is mixed into a clear chicken-based broth and finished off with a small sized pasta (such as tubettini or macaroni). To make the meatballs, place the ground chicken, sausage, bread crumbs, garlic, parsley, Pecorino, Parmesan, milk, egg, salt, and pepper in a bowl and mix well. Using a heaping teaspoon, drop 1 1/4-inch size meatballs onto a foil lined pan. (This recipe yields approx 40 meatballs.) Bake for 30 minutes, until cooked through and lightly browned. Set aside. In a medium-large size pot boil water and cook pasta according to package directions. Drain in colander when ready. Ladle pasta into warmed soup bowls, add soup and sprinkle each serving with extra grated Parmesan cheese. In the meantime, for the soup, heat the olive oil over medium-low heat in a large pot. Add the onion and cook for 3-5 minutes. Then add in the carrots and celery and saute until softened approximately 5-6 minutes, stirring occasionally. Add the chicken stock and wine and bring to a boil. Stir in the dill and spinach and meatballs and simmer for 3 minutes. Spinach should be wilted. Add salt and pepper to taste. To serve, place a ladle of pasta in the bottom of each warmed dish. Then add in the soup and sprinkle with a little cheese. Serve with a nice crusty bread. Enjoy! And for my Italian friends, here is something fun that I found while researching this soup, which I am sure you can appreciate. 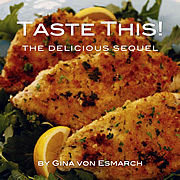 Anna Amalia, gives three versions of the Italian Wedding Soup recipe — one in Neapolitan, one in Italian, and one in English. It seems that while once quite popular in Naples, Minestra Maritata has fallen from popularity due the long list of ingredients called for, and because it is considered to be a heavy soup by modern standards. Mettìte a vòllere cu acqua abbundante ‘n’uòsso ‘e presutto, nu salamino (200 g), custatèlle ‘e puorco (300g), 3 sacicce, ‘na còtena, e mièzu chilo ‘e carne ‘e puorco, ‘e carne ‘e vaccìna, nu’ bello pièzzo, 2 cipolle,’na pastunaca, ddòie cape d’àccio, e facitele còcere pe’ ‘nu paio d’ore. Quanno è cotta, levàte ‘a carne, e, dint’o’ stesso broro, facìte còcere dui chili ‘e verdura ammiscàta, e cioè: cicoria, cappuccia, vruoccòle e vrùcculille, già lavata.Quanno ‘a verdura s’è cotta, sì vulìte magnà tutte cose ‘nsieme, ‘nce menàte ‘a carne ‘a dinto, e si’ nò, v”a magnàte come sicondo piatto. Sotto ‘a menèsta mettìtece pane de’ casa abbrustuluto. Con molto tempo e tanta pazienza potrete realizzare un vecchio vanto della cucina napoletana, e campana in genere: questa minestra in cui carne e verdure si “maritano”. Oggi è un po’ in disuso per il numero e la scelta degli ingredienti necessari, che ormai non fanno quasi più parte della nostra cucina quotidiana. Per chi pensa di poterseli procurare, ecco comunque la ricetta: Lessate in abbondante acqua un osso di prosciutto, un salamino di circa 200 g, 300 g di costolette di maiale, tre salsicce, qualche cotica , 500 g. di carne di maiale e un pezzo (5-600 g) di carne di manzo. Unite anche 2 cipolle, 1 carota gialla, due coste di sedano e lasciate cuocere per un paio d’ore. Scolate quindi tutta la carne e tagliatela a pezzi. Nello stesso brodo di cottura delle carni lessate 2 kg di verdure assortite, precedentemente lavate, tra cui la cicoria, la cappuccina, i broccoli e i broccoletti. Quando le verdure saranno cotte, unite anche la carne al brodo, se desiderate mangiare tutto insieme, altrimenti servite la minestra di verdure con dei crostini di pane casereccio abbrustoliti e la carne a parte, come secondo piatto. Un piccolo consiglio: perché il piatto sia più leggero, bollire da solo l’ osso di prosciutto per qualche minuto, buttare l’acqua di cottura, e poi cucinare il tutto come prevede la ricetta. With a lot of time and patience you can make this old soup recipe, the pride of Neapolitan cooking, where meat and vegetables are “married” togheter. Today, this soup is not very widely used on account of the vast number and choice of the necessary ingredients, which do not play a part anymore in our daily cooking. For those who are able to procure all the ingredients, here is the recipe: boil in lot of water, the bone of a leg of ham, a salame sausage of about 200gms, 300 gms of pork chops, 3 sausages, some pork rind and 500 gms of pork and beef. Also add 2 onions, 1 yellow carrot, 2 sticks of celery. Leave the lot to cook for a couple of hours, then drain the meat and cut into pieces: In the same meat stock, boil about 2 kg of assorted vegetables, amongst which cicory, “cappuccina” i.e. a type of salad, broccoli and brussel sprouts. When the vegetables are well cooked, add the meat to the stock. 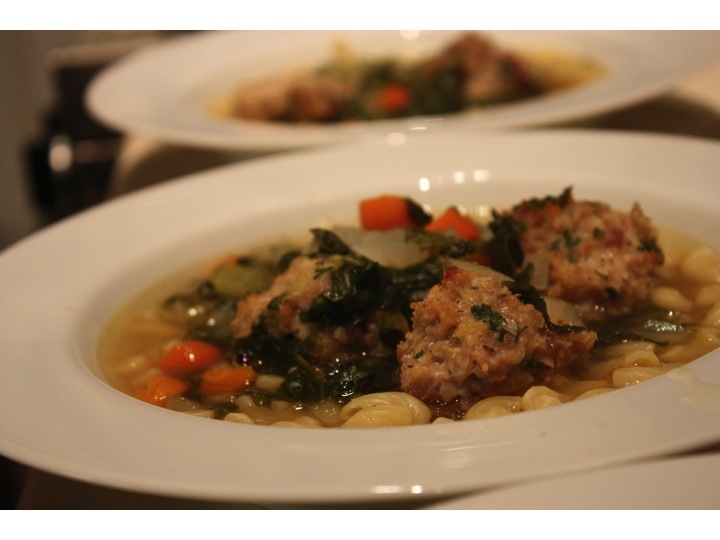 This Italian wedding soup looks yummy and such a healthy meal too. I feel like cooking one now.